Have finally found a bit of time for cardmaking in my craft room!! Christmas was good - quiet in a few spots, family time too and great food all the way around!! 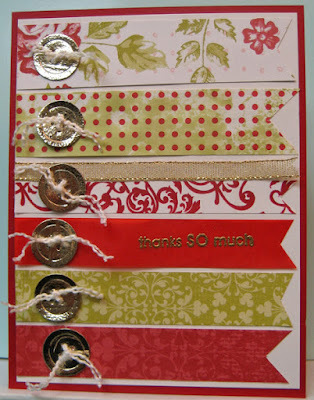 I have started on my thank you cards for those wonderful blessing which showed up over the Christmas season!! I usually use gift wrap from my gifts but no gift wrap as the gifts showed up in bags and boxes which will be reused!! So I decided to use up some of my scraps and cut some strips in green and red for this card. I flagged the ends of the strips and glued them to a layer of white cardstock and trimmed them even with the left hand side. I die cut some buttons from gold paper that housed some of the small ornaments we used for our Grinch Trees Fundraiser before Christmas. It was great because the very well used foam and cutting plates added some fun texture to the very shiny gold paper. I added white fiber to them and tied it off with a double knot before gluing them to the left hand side of the strips. I stamped the greeting on the red vellum strip and embossed it with gold embossing powder. Finally I glued this large element to the front of a red card!! 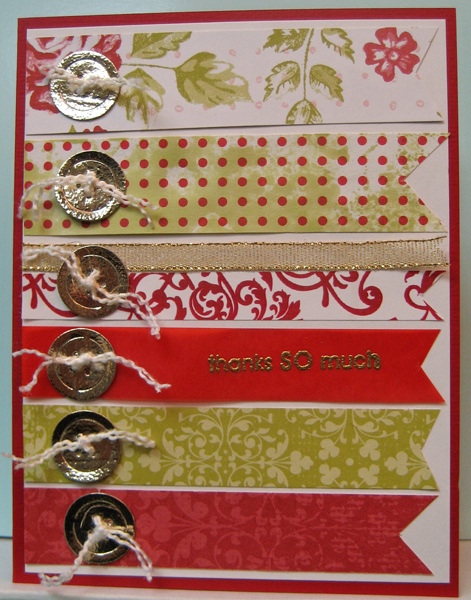 It is great to be back in my craft room and I am looking forward to a few more cards! !